How do you know when you’ve hit on a good chocolate chip cookie? When everyone who tastes one reaches for another. Chocolate chip cookies are funny things because, though just about everyone (except for a few crazies) likes them, everyone has a slightly different opinion about what makes a good one. Jeffrey Steingarten said it much better than I could hope to in It Must’ve Been Something I Ate. He likes thinner, crispier, butterier chocolate chip cookies. I like not-too-thin, crisp-on-the-edges and chewy-in-the-center chocolate chips. I add enough oatmeal to ensure a bit of a chew, but not enough to qualify as a oatmeal cookie. There is a nice amount of chocolate chips, but if you must have nuts in your cookie, add 1/2 cup of walnuts. If you don’t have quick cooking oats, you can substitute instant. If you only have regular rolled oats, whizz them in the food processor or blender to break them up. Preheat oven to 350F and line a few baking sheets with parchment paper. In a large bowl, cream together butter and sugars. Blend in vanilla extract and egg. Slowly add in the flour mixture until nearly combined. Add in chocolate chips and stir until dough is uniform in color and chip distribution. Drop by rounded tablespoonfuls onto prepared baking sheets. Bake at 350F for 11-13 minutes, until lightly browned. Remove to a wire rack to cool. Where do you find the time? A new dish everyday… This one is gonna ruin my attempts to start running and get healthy, I better start moderating if I want to make any progress. P.S. I think Steingsrten is hilarious. Mmm… nothing like a chocolate chip cookie! I like the oatmeal addition, I’ll definitely have to try ’em! Addictive Chocolate Chip Cookies? Isn’t that like saying, Sitting Chair or Cooking Stove? C. Chip cookies are hands down my favorite. Mostly because my gramma would make them for me when I was a wee lad, got to take a bag home. That right there is love. I’ve made them a few times since she passed, but it just wasn’t the same. Ahhh, the good ol’ days. Gia-gina – Making new things always motivates me to exercise. Whether I do or not is a different matter…. Zarah – I say keep trying them until you find your favorite! Dr Biggles – Yes, but notice how much more appealing they sound with the word “addictive” in the title. You can never have enough Chocolate chip cookie recipes. They look awesome! My gawd! In the last few days I’ve been looking for a choc chip cookie recipe that includes both oatmeal and walnuts, and haven’t found anything that I really like. I was about to experiment on my own…and there you go posting the exact recipe I want. Incredible! Something I’ve wondered recently – who are the recipients of all your baking goods? Do you have a posse of tasters, or do you have a lot of cakes and breads sitting around in your kitchen?! I just discovered your page (from a link in 101 Cookbooks). I must say, the Hot Chocolate photo makes an amazing desktop for my computer! What are those gorgeous orange specs in the marshmallows? Great recipe! Ground oatmeal is a great way to add incredible texture to a chocolate chip cookie… that’s a secret ingredient in my recipe, too. Oh. Wait. Not so secret anymore. Well, then, might as well go “all the way” and tell you the other secret: when you are grinding up the oatmeal in the food processor, put a hunk or two of semi-sweet choclate in there and grind that down with it. Proceed as usual. Adds texture AND chocolate-y goodness! Yum! Joe – Thanks. I agree! Niki – Good question! Me, my brother, my neighbors, friends…. I haven’t had too much of a problem disposing of things in the past! Anonymous – Thank you. They’re orange marshmallows that I made a while back. Aimee – Great tip! I’ll be trying that soon! Thanks for the recipe. I will try it, it sounds great. I made these cookies yesterday and everybody loved them! They are definitly addictive…they are just soo crispy and yummy. I made these cookies last night, and they’re really good! 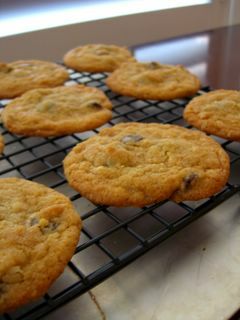 I decreased the salt (I always do), and added an extra Tbsp or so of semi-sweet chocolate chips. Thanks for the recipe! I made these cookies yesterday…I only put half of the chips and used brickle bits for the rest….my family loved them….they are gone already….they were delicious….. I make a lot of your recipe’s but being British and living in the UK i obviously have to use different measures and slightly different ingredients, i tried these and they turned out very very dry – tasty but still quite crumbly, are yours like that? or is it just my ingredients? also i think my tablespoons are different to yours…i got only about 24 cookies – how wide are yours? (sorry for so many qu’s). Thanks for the recipe, I love these cookies! Wow! I just discovered your blog and I’m hooked. These cookies rock! Can’t wait to try some more of your tempting treats. I would lessen the salt a bit. but they were so yummy! My daughters are allergic to oats. If I take that ingredient out do I need to change anything else? Is there a substitute for the oats?